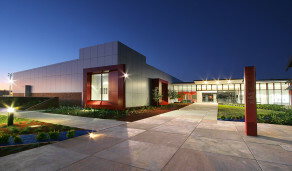 Western Plains Cultural Centre (WPCC) is located in Dubbo, incentral western New South Wales. Established in 2006, the WPCC incorporates Dubbo Regional Gallery -The Armati Bequest, Dubbo Regional Museum and the Community Arts Centre. Housed on the site of the old Dubbo High School, the WPCC is spread across three buildings, featuring permanent and temporary exhibitions, publically accessible studios, rooms and services (Family History, U3A) and the Outlook Café. Focused on historical and contemporary arts, craft and design, heritage and social history, the WPCC is managed by Dubbo City Council and engages audiences with the diversity of arts practice, history, ideas, objects and themes presented through exhibitions, public programs and events. Visit the Western Plains Cultural Centre website. Mark Nugent on CUSP at the Western Plains Cultural Centre. Coachbuilder Mark Nugent discusses the impact CUSP could have for Dubbo.